This post is the direct result of a conversation with my father. In a way, dad encouraged me to clarify my thinking on pasture fertility and my strategy for moving it forward. If this post is too long for you allow me to summarize. You could simply feed the plants nitrogen and they would be tall and green (though high in protein but low in soluble carbohydrates). But the better long-term investment is to feed the microbes that feed the plants. The idea is that healthy soil grows healthy plants, healthy cows and healthy people. Like teaching fishing rather than giving a fish…except dirt doesn’t go fishing. You know what I mean. Dozer: It’s a single cell protein combined with synthetic aminos, vitamins, and minerals. Everything the body needs. Mouse: It doesn’t have everything the body needs. What does a healthy plant look like? …taste like? Can you taste the difference between a tomato that was grown from artificial N, P and K and a tomato that was grown in compost? Does it have a weak flavor? Can a cow taste the difference between grass grown from NPK and grass grown from worm castings? N is N, right? When I look at the dark green stripe in my pasture where the chicken tractor has been, all I’m seeing is N, right? Well, no. I’m seeing a whole slew of things. But let’s start with what I’m not seeing. I’m not seeing dark green in most of the pasture. Why is that? Because there isn’t enough N in the soil. <sarc>No kidding</sarc>. Cattle have been grazing here for years. Why isn’t there enough N in the soil? (Flip your screen to see the answer below.) What’s a farmer to do? Clearly my pasture is suffering from a lack of Nitrogen. Should I order a tank of liquid nitrogen? Well, that would certainly make it green. But I think that’s like giving the pasture a bowl of runny snot for breakfast. It doesn’t have everything the body needs. What happens over the years if I just keep throwing fertilizer at a hay field and hauling the hay off? 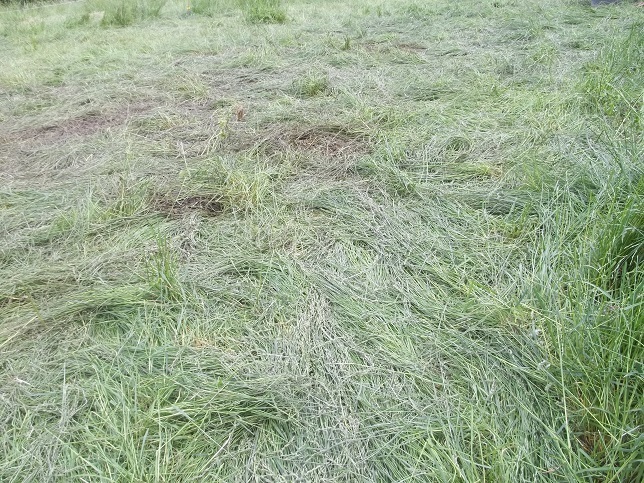 That is essentially what has happened with the cattle moving nutrients from the open area to the shade. I’m not just trying to grow a large volume of green grass this season, I’m trying to build deep root systems and healthy soil ecosystems so my grass grows earlier in the spring and later into the fall for years and years. I am trying to make my farm better for next year…for the next farmer. Nitrogen doesn’t have to come out of a sprayer. Nitrogen is fixed by living, breathing, dying organisms in the soil. What I need isn’t a sprayer unit. What I need is soil health…built over time. I have nothing to compare my farm with except my own farm. Fortunately, I have run livestock on the 20 acres around my house for several years. The cows, goats, pigs and chickens trampled and dunged on every square inch of it every few months for the past few years and have left enough plant residue behind to keep the soil warm, moist and well fed. The east 40 was all cows but had very little manure (the cows pooped in the shade) and zero plant residue (they ate it all because of continuous grazing). Let’s do this with pictures. I have done this for several years: All that muck and manure and all of those hooves and all of those plant stems pressed into contact with the soil have, over time, built up a layer of organic material covering the soil like a blanket, holding things together during periods of heavy rain, limiting evaporation during periods of drought and keeping the soil life fat and happy. Everything from bacteria to grubs to earthworms have plenty to do and a safe, moist place to do it. 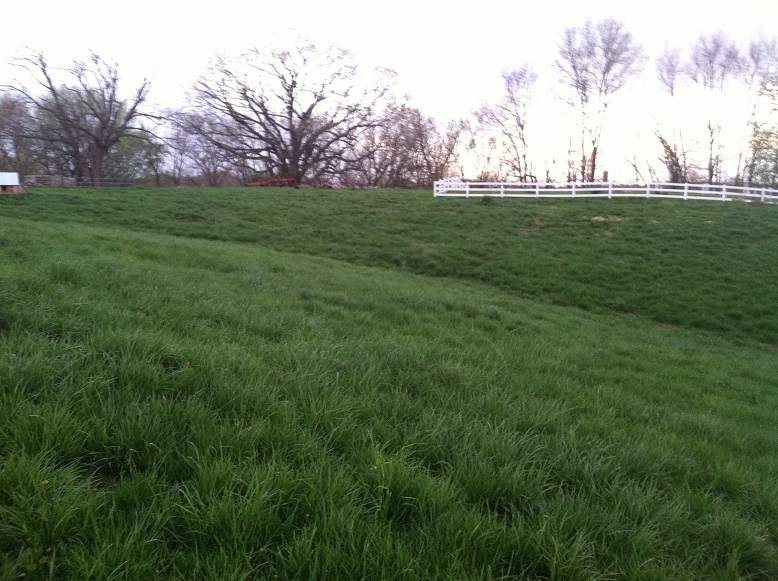 Compare that to the condition my east pastures have been kept in: Every time the grass grows a little it is nipped off. 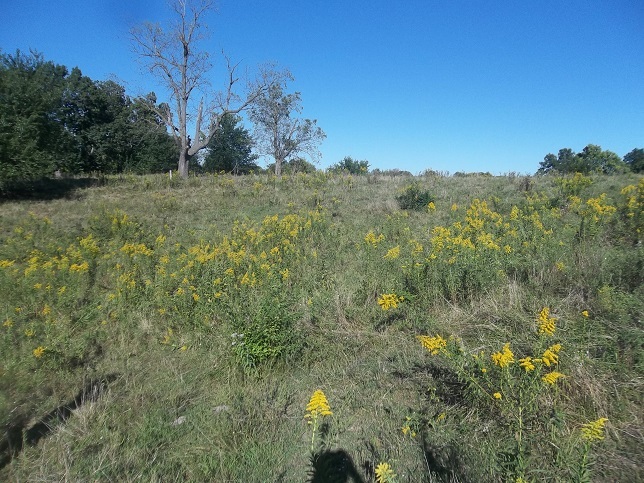 Goldenrod is ignored by the cattle so it dominates the landscape…and shades out future grass growth. Since the cows are allowed to spread out over a large area they don’t trample in the weeds, stomp the saplings or cover the pasture evenly with manure. In fact, all of the manure gets concentrated in the shade…which is why there are so many dead trees…and the remaining trees are bushy, thorny monsters. The difference between the pastures is obvious but it does take a little time. That’s why you have to increase stocking density (animal units per grazing area) before you can increase stocking rate (animal units on the farm). 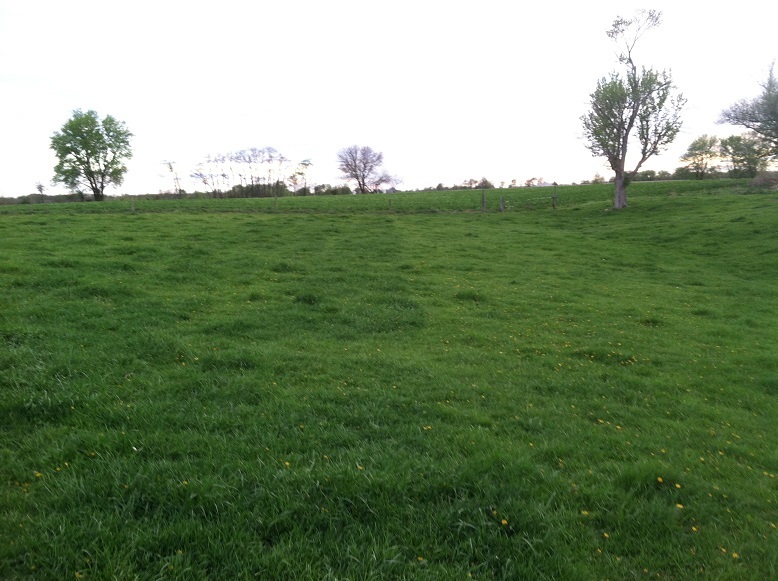 You need to build pasture health before you can expect it to grow more forage. Bunch the cows up. Shorten grazing periods and extend rest periods. Things will start to change. I think it is worth celebrating the little bit of life we have breathed into the pasture while also adding a little to the farm cash flow. The broilers, like the cattle, are tightly bunched up, grazing, trampling and manuring a small area. Sure, they put down N, P and K as they pass but they put down much, much more. And don’t overlook the value of the trampling action. It’s not just manure being fed to the soil, it’s grass stems. Not to mention the bugs, worms, etc that get eaten, adding value and nutrition to the pasture and not accounted for in the NCSU link above. So, yeah N = N but N != Chicken Manure. The N certainly makes it obvious where the chicken manure went a few months ago. But in years to come we will still see the benefits to the soil biology. And that is worth crowing about…even if we work to blend the stripe in with pig bedding, cow manure and horse manure…a balanced, varied diet…everything the pasture needs. This entry was posted in Composting, Manure, Pasture Management. Bookmark the permalink. This was a great post. Long term investment return versus short term instant gratification. Over the long run an investment will pay off over and over. Messing with cyclical short term gains in the long run will always end badly. There is no such thing as a free lunch. It is no different even when it comes down to Economics or Ecology. Thanks Charles. I hope to publish my reflections on chapter 3 of Farmer’s Progress tomorrow. This concept is explored in depth…both fertility and finances. Love your posts– style, content, inspiration.